International Friendship Exhibition — Primary. 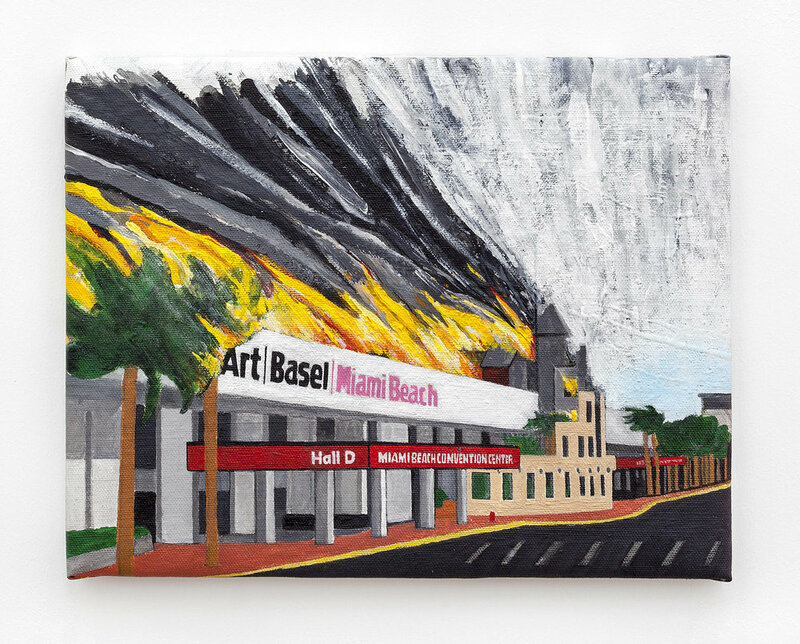 (Miami, FL) October 2014 – Primary Projects (“PRIMARY”), in association with FAMILY, presents “International Friendship Exhibition,” a group show of 19 artists—including Autumn Casey, Jim Drain, Gavin Perry, Asif Farooq, Magnus Sodamin, Cole Sternberg, Cody Hudson, and Michael Vasquez—titled in reference to Kim Jong-il’s gift pavilion of the same name. On view during Art Basel Miami, with an opening reception on Wednesday, December 3 at 5:00 p.m., the exhibition pays homage to the nature of contradiction, a concept ironically exemplified in the aforementioned kitsch-and-propaganda-filled pavilion in North Korea. While gifts from the Communist party and Michael Jordan-signed basketballs are hardly fair guise for North Korea’s complex history, the interplay of tawdry and fear is a testament to the power of contradiction itself—its own history has informed the very fabric of the universe, from mathematical equations to politics and philosophy. Presenting the concept of contradiction microcosmically and sometimes self-referentially, the works at PRIMARY’s “International Friendship Exhibition” instigate an open conversation about contradiction: both in meaning and for society’s ongoing need for it. Among the group is Cole Sternberg, whose piece features twelve 18×18” paintings of overlapping texts, accompanied by an installation containing 94 charred American flags—a simultaneously political and apolitical sentiment. 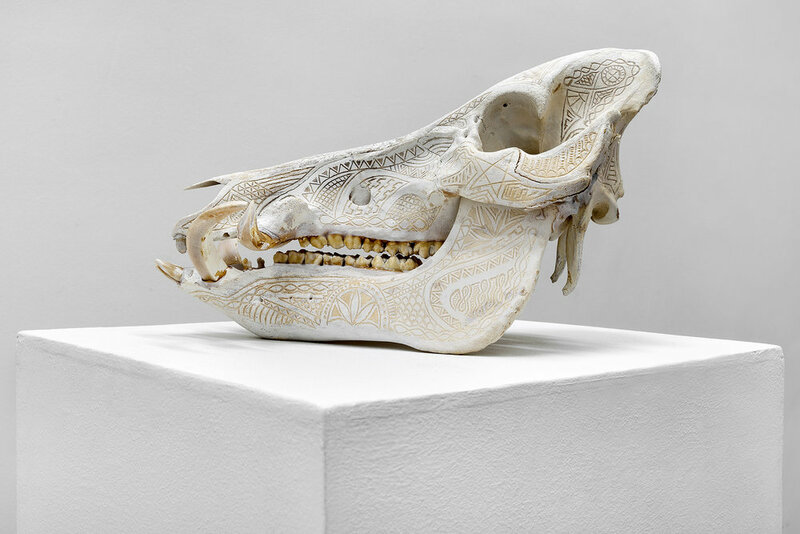 Best known for his cardboard-sculpted guns, Asif Farooq steps outside this genre with neon installation Desaparecidos. Translated as “missing,” this work was created—along with a powder-coated, candied pink riot barricade—as an allusion to the persons who have disappeared in geopolitical conflicts throughout history and today. Perhaps due to their frequency, these happenings are almost accepted and normalized. A multifaceted concept, contradiction is explored both playfully and thoughtfully in this exhibit: Autumn Casey’s centerpiece work, a metaphysical and metaphorical self portrait, features a turn-of-the-century Ferris wheel seat and invites viewers to get inside and interact. Gavin Perry’s giant rebar rainbow, Rainbows and Unicorns, examines what Perry refers to as “one of the most overused and quotidian artifices of man…Figuratively, they remain in view and yet are never reachable…[they are] fantasy and fact.” Zachary Balber’s Recomposing Sister features glamour shots of his sister, taken before her untimely death, and investigates the role of societal female objectification while reflecting on dichotomy and memory. Works from : Zachary Balber, Autumn Casey, Jim Drain, Asif Farooq, Andrew Horton, Cody Hudson, Jessie Laino, Beatriz Monteavaro, Andrew Nigon, O,Miami, Kenton Parker, Gavin Perry, Bayne Peterson, Magnus Sodamin, Karen Starosta-Gilinski, Cole Sternberg, Alex Sweet, Reed Van Brunschot, and Michael Vasquez.